This holiday will take you through a landscape with soaring heights and deep valleys, rivers of crystal-clear water, pristine forests, and meadows with wild flowers. The north-west of Slovenia is dominated by dramatic white limestone mountains, the Julian Alps (Julijske Alpe), with the highest peak, Mount Triglav, standing at over 2800 metres/9240 feet high. You will walk in a landscape of soaring peaks, deep valleys, rivers of crystal clear water, pristine forest, and meadows filled with wild flowers, which in winter are blanketed in snow. This is an area of crashing waterfalls and beautiful lakes, among which Lake Bled is the most famous, whilst nearby is the relatively untouched Lake Bohinj – you will be on the shores of both. This is a self-guided walking holiday for people of moderate fitness, and although it is in an Alpine area, no climbing or scrambling is involved. Price: £595 per person based on 2 people sharing. 7 nights’ accommodation in hotels in a double room with WC and shower, on bed & breakfast basis. Transfer of persons on days 3, 4 and 6. Luggage transport between hotels (one piece per person). Information package including detailed route description with corresponding maps (one per room). Back-up service (hotline) during the trip. Additional luggage: next to one piece of luggage (20kg max. each), a handbag is free of charge. For every additional item there will be additional surcharge of 10 EURO – to be paid locally. 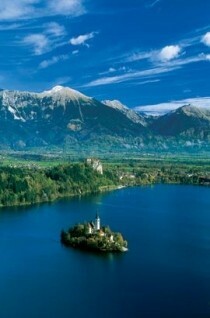 Additional night in Bled in 3-star hotel, £55 per person per night in a double room, B&B. Single room £80. 3 course dinner: £15. Transfer from Ljubljana airport to Kranjska Gora: £55 per person. Return to the airport from Bohini: £50 per person. Minimum number of persons for all transfers is 2. Famous ski resort of Kranjska Gora is the starting point for this tour. Also a popular ski resort, it is most famous for hosting the annual World Cup Slalom every January. You will spend your first night here in the shadows of the mighty western Julian Alps (family hotel 3*). Your warming up walk will take you via a trail to the end of Jasna Valley. Emerging at the other end is the glorious mountain arena of the Prisank and Razor Mountains. A typical hikers lunch can be taken in Krnica hut. Upon return, one can visit the “Russian Chapel” a touching monument dedicated to Russian POVs’ who died during WW1 while building the military road over Vršič Pass. Alpine walk (hotel 3*): 18 km round walk, ascent 500m. This walk takes you to the summit of Mt. Peč (1508m) to the triple border point where Slovenia, Italy and Austria meet. At the top you can soak up the dramatic views across the Julian and Carnian Alps, with Hohe Tauern, the highest alpine range in Austria, forming a picturesque backdrop. The trail then descends through the valley to the source of the mighty Sava River, the longest in Slovenia, back to Kranjska Gora. Forest and mountain meadows trail (hotel 3*): 19 km round trip, ascent 640m. You will begin your walk after a car transfer through the Radovna Valley, an untouched wilderness between the Pokljuka and Mežakla plateaus. You will be dropped off at the start of the stunning 1.6km Vintgar Gorge, carved 150m deep into the mountains by the Radovna River. The trail leads along a wooden walkway through the gorge and onwards to the world-famous Bled Lake, via the lovely Katarina Church viewpoint. Your hotel is on the western side of the town, overlooking the lake. Valley & meadow walk (hotel 4*): 11 km, ascent 200m. 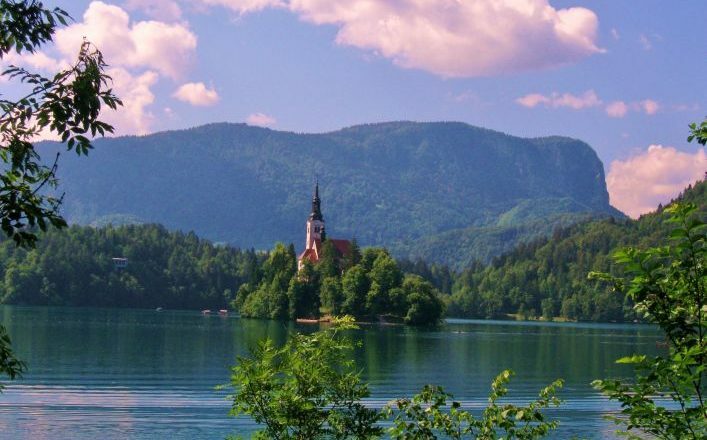 Today you will take a leisurely stroll into Bled, a world-famous town on the shore of a beautiful glacial lake, with its unique island church sitting proudly in the lake, and the castle perched high upon a cliff standing guard over the town. A short panoramic walk can be taken to the villages of Kupljenik and Bela. For the best photos of the lake, castle and Karawanke range, photographers will want to ascend Osojnica. End the day with the local speciality – the cream cake “Kremšnita” – in one of the great little tea shops beside the lake. Hillsides and panoramic walk (hotel 4*): 15 km round trip, ascent 270m. 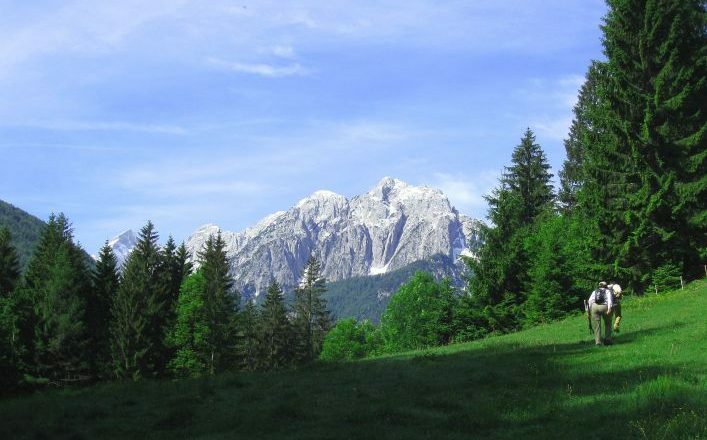 You will be driven by car up to the Pokljuka Plateau from which you will begin your hike across mountain pastures and old farmhouses where you will come to a viewing point providing outstanding views into the Bohinj Valley. As you descend you can stop at the little historic village of Studor where you can visit the museum and see how people lived 150 years ago. 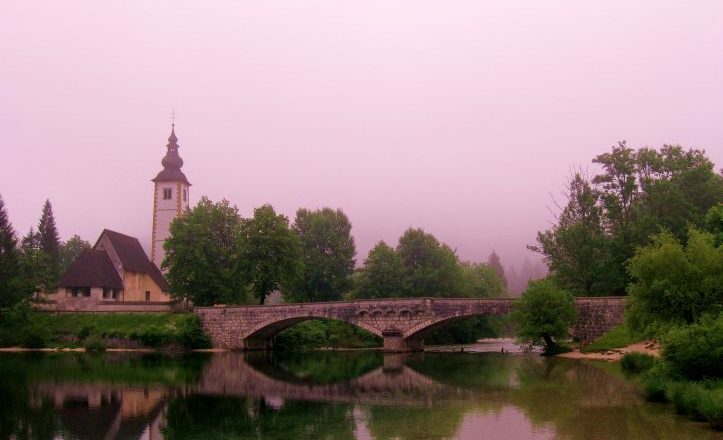 Your final destination is Lake Bohinj, the jewel in the heart of the Triglav National Park, and the small settlement of Ribčev Laz (Fisherman’s Pass). 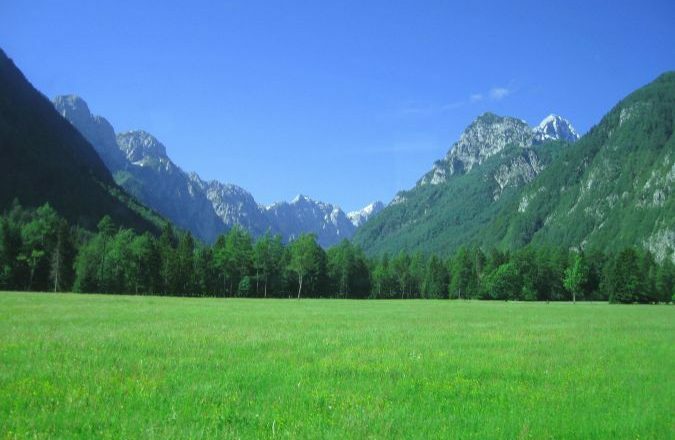 Mountain meadows & tree line walk (hotel 4*): 12 km, ascent 200m. Spend the day strolling around this wonderful, tranquil lake sitting in the shadows of the immense mountains of the Julian Alps. Warm weather permitting, you can swim in its crystal-clear water. Try the delicious Bohinj trout. At the western end of the lake is a short trail up to Savica Waterfall, which feeds the lake. Then you can take the cable car up to the 1532-metre high Vogel Mountain for a spectacular view of Mount Triglav, the highest peak in the Julian Alps. Spend the evening in one of the cosy village pubs and try the local home-made honey brandy. Lakeside/ valley walk (hotel 4*): 16/23 km. Day 8: DEPARTURE after breakfast. By plane: closest airport is Ljubljana (LJU). Several airlines serve it (e.g. Easyjet, Adria, Finnair, AirFrance). From the airport you can travel to Kranjska Gora by bus (change once in Kranj, takes about 3 hrs) or book transfer (faster) through us: £55 per person, two persons minimum. Transfers need to be ordered and paid for when booking the trip. By car: take exit Karavanke from the A1 motorway Ljubljana – Jesenice, Karavanke and then follow signposts to Kranjska Gora. From the motorway Villach – Venice, take exit Tarvisio in Italy or exit Villach West in Austria. Unguarded parking at first hotel for the duration of your trip costs 5 EUR per night per car. By plane: need to get to the airport? You can book transfer to Ljubljana airport: return to the airport from Bohinj – £50 per person, two persons minimum, best booked through us. 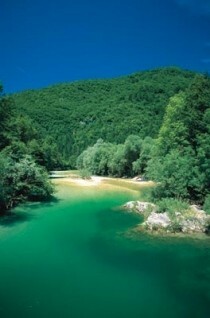 By train: Bohinj has a railway station at Bohinjska Bistrica, 5km from your last hotel. It is on the Jesenice – Nova Gorica sideline, only a few trains a day. Useful for travel in all directions. By car: if your car is in Kranjska Gora, you can get there by local bus (change once in Lesce, travel time is around 2 hrs) or we can arrange for transfer for £50 per person, two persons minimum.